The start of the New Year means that the NBA season beings to kick into high gear. Believe it or not, each NBA team has already played around 30 games, and players now face a barren winter filled with back-to-backs and three games in five nights-like hurdles prior to the All-Star Break in February. Several former USC Trojans will be facing these obstacles as “Projans.” There are currently five former Trojans in the NBA, as well as one in the NBA Development League. With the season nearly halfway over, let’s look back at how the “Projans” have fared so far in the 2013 season. Nick “Swagy P Based God” Young– I’ve already chronicled the meteoric rise of the Lakers shooting guard, a rise capped when Young took LeBron one-on-one in the third quarter of the Lakers-Heat Christmas day game and briefly came out on top. This quarter featured Young at his explosive best; drilling threes and bringing the Lakers back to within a couple points of the lead. However this quarter was not that large of an aberration, at least considering how well Young has played so far this year. Young is leading the Lakers in scoring with 16.5 points per game. He’s also having the best year he has ever had personally. He’s averaging nearly 5 points more than his career average of 11.7 PPG, while also playing nearly 5 more minutes then his career average of 23 minutes per game. He’s also ripped refs, shown up to games in absurd outfits, and hit over his head half-court shots. The Lakers may be 13-19 and on their way to the NBA lottery, but Young will make he rest of the Purple and Gold’s season at least entertaining. Nikola Vucevic– The Magic have struggled even more than the Lakers, but they too have had a bright spot in a former Trojan. Vucevic is having another strong year, averaging 13.4 points and 11.1 rebounds so far after averaging a double-double in his sophomore season as well. Vucevic is sixth in the league in rebounding, and just like Young, Vucevic is getting five more minutes per game then his career average of 27.4 MPG. 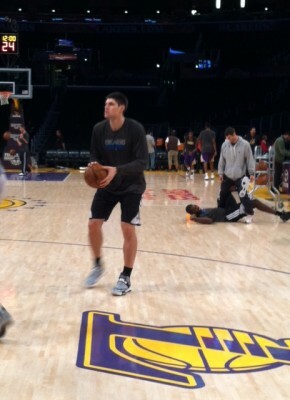 The Magic are 10-22 and headed for a high spot in the lottery, but Vucevic has been one of their lone bright spots. O.J. Mayo– The trend of Trojans on terrible teams continues with Mayo, who has had an up and down year in his first year with the Bucks. Mayo had a brutal December, shooting only 36.8 percent from the field. The Bucks as a team have put up similarly ghastly numbers. The 7-25 squad is 29th in the league in points per game and 26th in the league in rebounds. Mayo’s averages are down across the board this season. He’s averaging 13.3 PPG; down from his 15.1 PPG career average. He’s also averaging marginally less assists and rebounds and is playing 29 minutes per game, down from his career average of 33. Taj Gibson– It’s been a brutal year for the Bulls. With Derrick Rose out again their NBA title aspirations have turned into a pipe dream. The Bulls are 13-18, making this season a struggle for those in the Windy City. However, one bright spot is Gibson. The defensive enforcer has retooled his game on the offensive end and has become much more of a complete player. He’s averaging 12 points per game and 6 rebounds per game. He’s also playing 27.1 MPG, becoming much more of a focal point for the Bulls offensively, a role he’ll have to keep as the year continues. 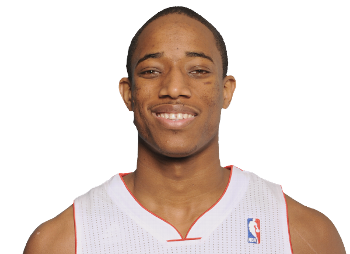 DeMar DeRozan– Coming into the season it was assumed that the Raptors would be “Riggin’ for Wiggins, but they have thrived in the abysmal Atlantic Division. The Raptors actually have a .500 record at 15-15, and DeRozan is a big reason why they are playing above expectations. DeRozan scored 26 points in the Raptors’ stunning victory over the Pacers yesterday, and is averaging nearly 21 points per game this season to go with 3.3 assists and 4.4 rebounds. He’s playing a career-high 38 minutes a game and has a career-best 30.7 percent clip beyond the three-point line as well. Dewayne Dedmon– Dedmon went pro after last season and has bounced around between the Warriors and their D-League affiliate in Santa Cruz this year. Dedmon was waived last month by Santa Cruz, but then he resigned with them and has continued to spend most of his time in the D-League. However he has played in four games this year for the Warriors, where he played a total of 6 minutes and had 1 point. He’s thriving in the D-League, however, playing 35 minutes a night and averaging 15-15 in points and rebounds through nine games. He’s one of the top-rated players in the NBA’s minor leagues, and is positioning himself for another call-up. Bonus: Brian Scalabrine, in his second year after retiring, is an assistant on the 21-13 Golden State Warriors. Scalabrine was a Chicago Bulls broadcaster last year, and is now on the road to working his way up the coaching ranks.